Spend 98% less time shredding, save time and money with Auto Feed shredders. This personal shredder shreds up to 65 sheets (70gsm) or 60 sheets (80gsm) automatically in to approx. 200 4x45mm cross cut pieces each (P-3). 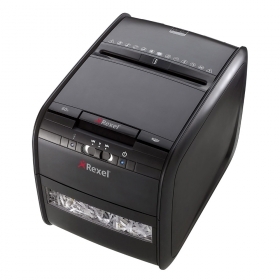 With the Auto+ 60X shredder, you do not need to stand and feed it, or even remove staples or paper clips first. It has an automatic feed and a 15 litre bin so you can load up to 65 A4 sheets and leave it to get on with the job. Auto Feed - Stack, shut, done - auto feed means no more standing at the shredder. Shredding up to 60 sheets every time, (or 5 through manual feed) save up to 65 percent against shredding services, and 2 minutes of your time versus traditional shredding. This shredder reduces documents to 4x45mm cross cut particles - every 60x is designed with a cross-cut security level of P-3 for added peace of mind. Easy to empty 15 litre pull-out bin makes emptying simple. Combine handy viewing window with high capacity bin to plan accordingly. Know where you stand with the world leaders in auto feed shredding. Protect all aspects of sensitive material with the additional capability of credit card disposal. Swift destruction for increased security with the best value auto feed shredder on the market. An intelligent mechanism makes light work of fiddly paperclips and staples for increased productivity. Every 60X shreds staples and paperclips to save up to €300 per employee per year when compared with traditional shredders. Easy use controls as well as indicators for *'power on' and 'cool down' make the 60X simple to use no matter situation or environment. Paper jams are reduced with an ingenious manual reverse feature. Swiftly fix paper potential paper jams in seconds, eliminating office hold ups and putting an end to the no. 1 shredding frustration.